Also Recommended: Nyquil. It puts you out like a light if that's what you need. Notes: Yes, it's based on a visual novel game made by AUGUST. VN game-based anime series that has a connection with insurmountable amounts of boredom? NO WAI! The Moon and the Earth have never been on the best of terms, something which stems back to the -- not making this up -- Oedipus wars that once was fought between the two kingdoms. To better relationship between the Moon and the Earth, princess Feena Fam Earthlight of the moon is sent to a homestay on Earth. How many times is it possible to retell the same trite, tiresome and cliche'd love story? While my limit for that kind of thing has been crossed many, many shows ago, Brighter than the Dawning Blue apparently sees fit to give it another go. So, what do we have? We have a fairly nondescript guy who just HAPPENED to live in the household chosen for the homestay of the Moon's princess, no less. His mother is dead, of course. I don't know whether it's in a traffic accident, but I wouldn't put it past them. And his father is... well, I'll get back to that a little later, as it's probably the only source of actual entertainment this show has. From the VERY FIRST EPISODE, the course is set. There shall be no mistaking this show from basically running its course in having our man fall in love with the gorgeous (and by gorgeous, I mean Mary Sue gorgeous -- long silver hair, princess crown, have the weight of the entire moon's wellbeing on her shoulders) princess. Naturally, she comes with enough baggage to sink the Yamato, something that will be made very clear when the show chooses to, which is to say the last half. Until then, you may rejoice in the fact that the characters in this show will be going to school, working in a cafe during their spare time and... well, going to beach and other staples in shows like this. Also, the show itself is about the princess and the commoner, and you will not be permitted to forget it. Every single role outside of the two of them are relegated to supportive roles, and, as such, they're as uninteresting as the main couple themselves. The princess and the pauper will have each other by the end, and there will be no force intervening in this, not even blatantly racist and facist prettyboy generals. The show got twelve episodes to move through the main storyline. For a lot of shows, this is just about enough. For this show, it SHOULD have been enough, except most of the first half of the show is pretty much used for your average harem/romance fare. They meet, they go to school, they work at the cafe -- something which the princess, despite never having done anything like it ever before, somehow excels at from the get-go. Of course, there has to be a cooking contest where the princess goes up against someone with the magical ability to make pieces of coal out of every food item she attempts cooking, even those that don't NEED to be cooked. Hilarious. 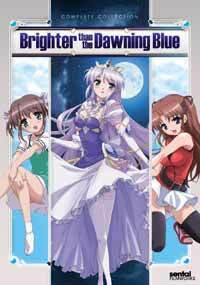 Brighter than the Dawning Blue even takes the most flagrantly overused cliches in romantic animedom; the meeting during childhood and the exchange of promises. It's mostly used to avoid having to deal with actual romantic development, which suits this show just fine. And naturally, the princess has been obsessing over this since then, even though the guy has apparently forgotten. When will it ever change? Also, for some peculiar reason, the princess has this old pervert working for her. According to her, he was a valuable asset to the royal family in the past, something you will probably have a hard time believing, given that his abilities seems to limit themselves to "filming the princess in secret, preferably in the bathroom". And if that's not a big enough hint, let me just say that when he enters the show, it's from underneath the princess' skirt. He later concocts a sceme that turns the average beach episode into a "ZOMG we got stranded on a deserted island somewhere" deal, naturally for his own nefarious purposes. I think his job designation is supposed to be "comedy relief", but that only makes me glad I'm not the one paying him his salary. If there's a single ray of amusement coming from this show, then that would be the episode featuring Tatsuya's father Chiharu, a rather blatant Indiana Jones copy if I ever saw one. When he appeared onscreen, running from huge, rolling boulders and adventuring for statues in dangerous temples... well, I actually laughed, even if it killed me inside a little. In the spirit of totally stealing stuff from other shows, I found the blatantness of it amusing, I guess. In the same episode, you will also find some Alien references when Feena whips out a gigantic gun and a radar rather reminiscent of the one used in the second Alien movie, complete with blinking dots and a very familiar beeping sound. The whole episode culminated with helicopters firing rockets at the house, which struck me as totally bizarre and utterly out of place for more reasons than it just being amusing. It's all contained within that single episode, though, so don't get any ideas that it makes the show actually worth spending time on. There has been a lot of crappy shows like this released, especially over these last years, but few match the unadulterated staleness of this show. It's lazy, it's dull and in the last half, you're practically bombarded with one speech after another in an attempt to make this show appear as if it's got something to say. And the show DOES have a lot to say, though preciously little of this is of actual value. It's a freaking Hallmark moment that never seems to end once it gets started. Just to give you an idea of how bad this show is, I can say that it was rated one of the worst shows of 2006 by the residents of 2CH. What hope is there for a show when it gets panned so badly by its target audience? It's a good thing you don't really need to find out. Recommended Audience: As far as objectionable contents go, this show is fairly light on them all. Fanservice and violence is fairly low-key. I can't really blame the show for being very offensive either, so in that regard, it's not so bad. It's just dull, dull, dull.